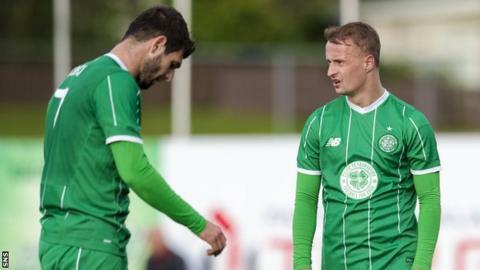 Former Celtic striker Scott McDonald has backed Leigh Griffiths to start ahead of Nadir Ciftci in Baku against Qarabag in Champions League qualifying. Ciftci has been preferred for the European campaign so far by manager Ronny Deila, but the Turk has started a six-game domestic suspension. "I would go with Griffiths, only because Ciftci has not played enough football," McDonald told BBC Scotland. "Griffiths gives you that threat in behind as well." Celtic go to Azerbaijan with a 1-0 lead in the third qualifying round tie with Ciftci having sat out Saturday's 2-0 win over Ross County in the opening Scottish Premiership fixture of the season. The 23-year-old rejected a contract extension from Dundee United, which paved the way for a £1.5m transfer ahead of his appearance before the Scottish FA on a charge of biting Dundee winger Jim McAlister in a derby game last season. "It's been very unsettling for him over the summer," said Motherwell striker McDonald, who thinks Celtic have enough quality to win the tie and progress to the play-off round. "With him not being able to play league football, I don't think he has played enough games. "Ciftci is still trying to find his feet, knowing when to come short, knowing when to play in behind. It will take him time. "Once he gets that first goal, he will do really well for Celtic. "We've seen his talents at Dundee United, but at this moment I would go with Griffiths." McDonald thinks Griffiths has shown a better understanding with midfielders Stefan Johansen and Stuart Armstrong. "At the moment, when Griffiths came on the other night, you could tell when Johansen or Armstrong, whoever got the ball, they knew where Griffiths was going," he said. "He was looking to get in behind. They looked very dangerous when that happened." Former Celtic goalkeeper Pat Bonner thinks Griffiths has improved at Celtic. "I like Leigh Griffiths," he said. "I think he has matured as a player. "The only problem is - if you are defending in numbers and you knock the ball long, who is going to hold it up and allow time for the other players to support? "Can Leigh Griffiths do that in European football? I'm not 100% sure. "I think he may start with Ciftci. I think he has been bought for European football, but I do like Leigh Griffiths and I think there are goals in him."